There are many paths up the mountain. We reject the clinical setting of most massage therapy clinics. Our main treatment area is shown at the right. A room of serenity where true healing can occur. We are licensed by the State of Texas as Massage Establishment, ME2512. We are also licensed by the State of Texas as Massage Therapy Instructors and as providers of Continuing Education for Massage Therapists. 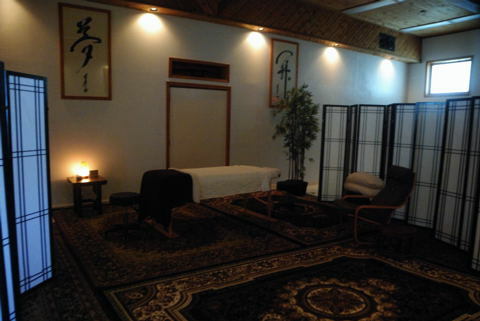 We offer both Relaxation massage and Therapeutic Massage. We are one of the few massage establishments in Houston to offer therapeutic massage in the Myofascial Release (MFR) style of John Barnes. In addition, we are the only massage establishment in the Houston area to have two MFR therapist rated as Advanced by John Barnes. Since many of the MFR techniques require two therapist, we can offer treatment options that other centers cannot offer. However, massage has many goals, from simple relaxation to the treatment of chronic conditions. Read the description below to find the type of massage that is best for you or consult with one of our therapists if you are uncertain. Prices below are for single sessions. We offer reduced rates for multiple session packages, purchased in advance. What type of Massage is appropriate for you? If you have chronic pain or some structural misalignment, especially if you have had other styles of massage that have not resolved the issue, try a Myofascial Release Therapy (MFR). We are one of the few Massage Establishments in Houston to offer the John Barnes style of MFR massage. This type of massage consists of very gentle pressure that is held 3 to 5 minutes at specific body locations. It is specifically design to release holding patterns in the body's fascia. Click here to learn about Myofascial Release. If you feel tired or tense, but you have no localized pain in your body or no limits of range of motion. Try a Swedish style Relaxation massage. This type of massage is designed to relax and pamper the body. It is not intended to correct structural issues, but often results in temporary relief of muscular tension which can reduce discomfort. The massage consists of long, gliding strokes with lotion along the body's major muscle groups. For many people, the relaxation is so profound that they fall asleep. If you are not sure which type of massage to select, our Massage Therapists will discuss the various types with you at your first visit. This is wha t many Americans think of as massage. Massage that relaxes the body with long integrating strokes and kneeding of major muscle groups. Pressure can be varied at the request of the client from very soft to quite firm. Usually the entire body, both front and back is massaged, but areas can be avoided or receive extra attention upon request of the client. Most clients find this style of massage very relaxing to both mind and body. Clients sometimes get so relaxed that they fall asleep during the session. This is a basic Swedish style of massage but with very gentle pressure that concentrate on pregnancy's special needs. Body posture for the massage changes as the pregnancy evolves. After about the third month, face down posture is no longer used. Most clients find side lying posture most comfortable after the sixth month of pregnancy. The goal of therapeutic massage is to relieve pain, restore function or range of motion or address some chronic pain or postural issues. This type of massage is for complaints such as lower back pain, tensed shoulders, stiff necks, etc. Myofascial Release and Reflexology use very gentle pressure and are usually quite comfortable. Often a therapeutic massage session can be concluded with some Relaxation massage so the clients leaves feeling relaxed. This may require a slightly longer length of time for the massage session. The John Barnes style of Myofascial Release (MFR) is a very gentle form of massage that is designed to release deep adhesions within the deep fascial layers of the body. Fascia, pictured above, (sometimes called dense fibrous connective tissue) is a 3 dimensional web like structure that permeates all the tissues of the body. (The photo above is of fascia that was taken with a small camera that was inserted under the skin of a living human. We have videos of fascial tissue in living humans which we can show to interested clients.) 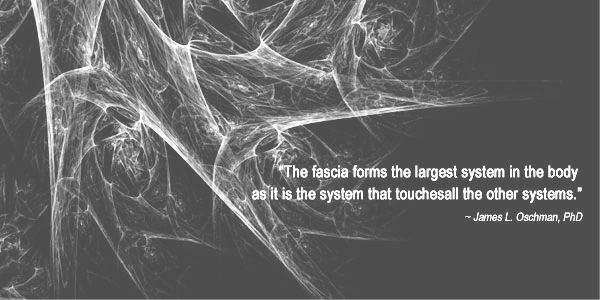 The fascia surrounds and interpenetrates our organs, muscles, bones and nerves and is richly endowed with pain receptors. It has a strength of up to 2000 pounds per square inch (which is about the same strength as the cord in a radial tire), so it cannot be forced into alignment. When the fascia contracts it can exert enormous pressure on our bodies and can generate intense pain. In the MFR techniques of John Barnes, very gentle, but long lasting (3 to 5 minutes) pressure is applied to release adhesions in the fascia which will then relax removing pressure from pain receptors and allowing bones to realign. This type of massage is very useful for treatment of chronic conditions such as the lower back that is often sore, or the neck that is often stiff. It is also useful to release adhesions that sometimes form after impact injuries or surgery. This type of massage is not painful. This type of massage was developed from the pioneering work of Janet Travell, M. D. in the 1940's. 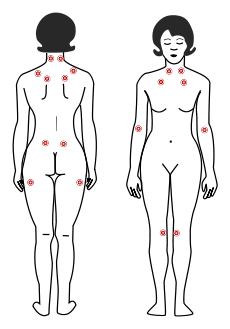 As illustrated to the right, Trigger points are hard lumps in muscles that often refer to pain to specific distant parts of the body. 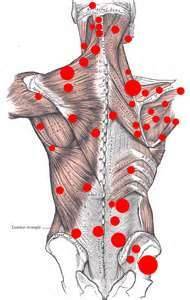 From the clients existing pain pattern, the therapist knows the approximate location to look for the trigger points. The therapist puts fairly intense local pressure on the triggerpoint until it dissipates. Sometimes, Trigger points occur in groups. The pressure to dissipate a trigger point can be painful since the trigger point is tender, but the relief provided is often profound. Reflexology is sometimes considered a part of alternative Medicine. We promote it for the relaxation it provides. It can be very useful to relax an area that is too tender to be directly touched. We do not advocate the use of Reflexology as treatment for any disease. "A natural healing art based on the principle that there are reflexes in the feet, hands and ears and their referral areas within zone related areas, which correspond to every part, gland and organ of the body. Through application of pressure on these reflexes without the use of tools, crèmes or lotions, the feet being the primary area of application, reflexology relieves tension, improves circulation and helps promote the natural function of the related areas of the body." The scientific mechanism by which Reflexology works is not known. However, there are limits to science. It does not mean Reflexology does not work, just because it is not known how it works. Most clients feel profound effects from this type of massage. It has been estimated that 5.8 million Americans suffer from fibromyalgia and that 90% of the afflicted are female. This medical condition is characterized by chronic muscle pain, fatigue and tender points on the body. Fibromyalgia is a medical condition that can only be diagnosed by a physician. Furthermore there currently are no medical tests that can "prove" that someone has fibromyalgia. The medical tests are utilized to eliminate other possible medical conditions. Formal diagnosis of fibromyalgia is very difficult and is usually done from the patients symptoms. In fact some physicians believe that Fibromyaligia is not "real" since it cannot be detected by medical instruments. This type of logic implies that disease was not "real" until the microscope was invented, which enabled the microbes to be seen! All sufferers of Fibromyalgia will tell you the pain is very real. The figure to the right illustrates the tender points that are often associated with fibromyalgia. Extremely gentle massage can provide temporary relief from the pain of fibromyalgia. Since the extent of relief varies between individuals, we recommend that suffers of fibromyalgia try one of our fibromyalgia massages before purchasing a massage package. © 2007-2019 Bay Area Center. All Rights Reserved.